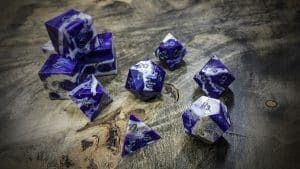 I want to start this review off by saying that Artisan Dice accommodated my request of making Fate/Fudge gator jawbone dice, which was really awesome. The dice have a nice feel to them and have a satisfying sound. There are some parts that are not quite so satisfied with or was surprised about when I got the dice, though. First is that two of the dice have a chipped corners and all four of the set have what appear to be abrasion marks on some of their edges and corners. I don’t think they are supposed to have the “abrasions” because it isn’t consistent across all the corners and edges. I was really excited about these dice, and it is disappointing that they came damaged like this. The other thing is not exactly a negative, but it did come as a surprise. 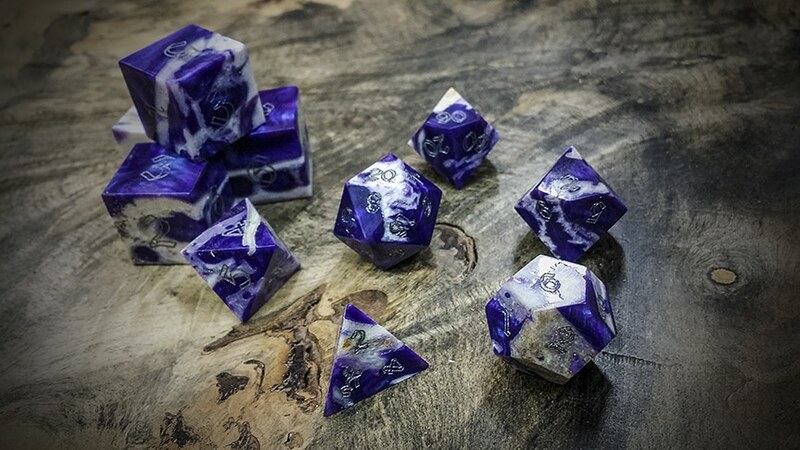 On my computer screen the resin parts of the dice in the picture of the sample set look like a really nice shade of indigo. Indigo is one of my favorite colors. The actual dice, however, are a shade of purple. It still is a nice color, it just wasn’t at all what I was expecting. Maybe my computer just doesn’t display the preview image correctly from the website? I got the dice last week and have been debating for a few days about how to write the review. All in all, a good set of dice but with a little frustration. All the other dice I have received from the seller have been flawless, so it was disappointing that the set I was looking forward to the most has flaws. that for the review! sound like your dice got past QC. please email us at contact@artisandice.com so that we may repair / replace them for you.